Adore Beauty is an official Australian stockist of freezeframe. Freeze-frame is where science meets beauty. 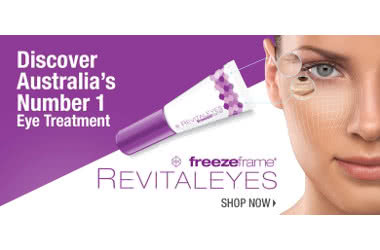 Every second, somewhere in Australia, a woman is choosing freezeframe. Every second, a woman is choosing to look as young as she feels. Every second, a woman is choosing to see real changes in her skin. Every second, a woman is choosing Australia&apos;s No 1 selling clinical skincare. With a unique portfolio of products, freeze-frame has become Australia&apos;s leading beauty innovation powerhouse. Not only the number 1 clinical brand, they also hold the position of number 1 body range and number 1 selling eye treatment in Australia. Never ordinary, the freeze-frame brand provides targeted clinically proven solutions to women most frustrating beauty problems - delivering real, visible results. Categories include Body Solutions, Face Solutions, Eye Solutions, Injection Free Alternatives and Lashes. Many products have instant results and are backed up with technologies to provide real changes for the long term. Founded in 2008 by beauty expert Sonia Amoroso, the freeze-frame mission is to empower woman to take their beauty into their own hands by providing alternatives to invasive procedures and professional services, without sacrificing results. Showing 15 products of 15. No much change in 3 weeks of use. Waiting for results. Have been using off and on the past few weeks, no significant page. I will likely repurchase as I&apos;m unsure if I&apos;ve been applying it properly. Feedback would be to have better instructions and a bigger tube.